On my quest to find organic face oil on Vitacost website, I came across Badger Organics range. Regrettably I had never heard of Badger Organics (to learn more about their principles, mission, etc – click here http://www.badgerbalm.com/s-12-about-us.aspx) before. To me, there is something incredibly refreshing to see a company that believes in purity and effectiveness of their ingredients, and believe money is their fuel not ultimate goal wins me over instantly. Bigger companies have shareholders to answer to but smaller private companies work for their customers! Kudos!!! 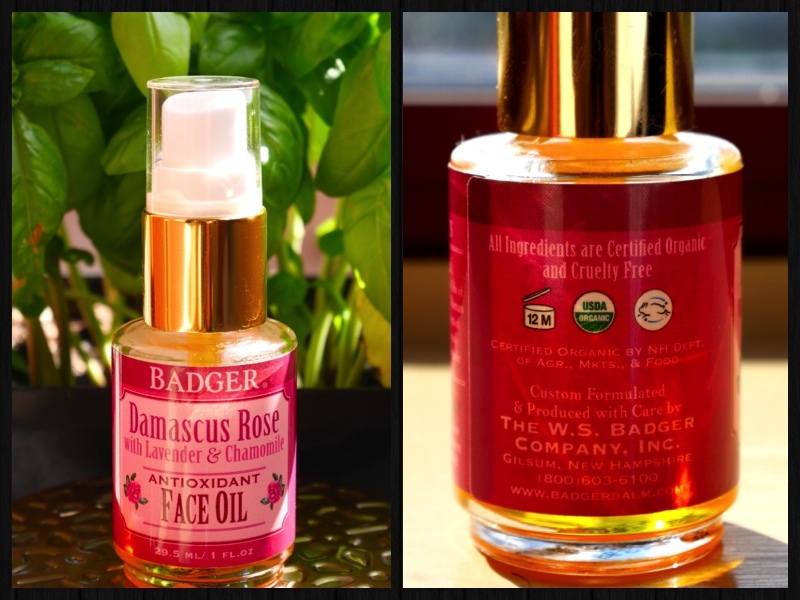 Simply based on their ingredient listing and company principles, I bought the Antioxidant Damascus Rose Oil. I have a weakness for anything rose based or naturally scented. The product claims to be highly absorbent – I agree, antioxidant rich, with rejuvenating base oils – amazing oils that don’t clog my pores and break me out, double yay for me. At a tender age of 29 (obvs with sarcasm) I don’t have wrinkles issue but I love how my skin looks next morning. My skin is combination, dehydrated and occasionally breakout prone and much to my delight I had no issue with this oil. Sometimes I mix this face oil with my Body Shop Vitamin E Overnight Serum-in-Oil. The results next morning are nothing short of fabulous, well rested, glowy!! I cannot wait to try more products from Badger Organics and share the love with all my lovelies.